Today everyone is living a very stressful life. This has a great impact on our physical and mental health. Little change in the routine can be really helpful for spending a quality life. It takes one away from all the stress and helps boost the thinking process by making the person more productive than before. Nature can be of best help for a person demanding change. If you are a person that leads an active life and is not interested in spending his vacations while sitting, hiking is your perfect shot. Every year many private and government organizations plan hiking excursion to fetch up the importance of the hills around. Organizing a trip takes more than that is visible to the eye. It is all about choosing destinations, making arrangements and responsibility. 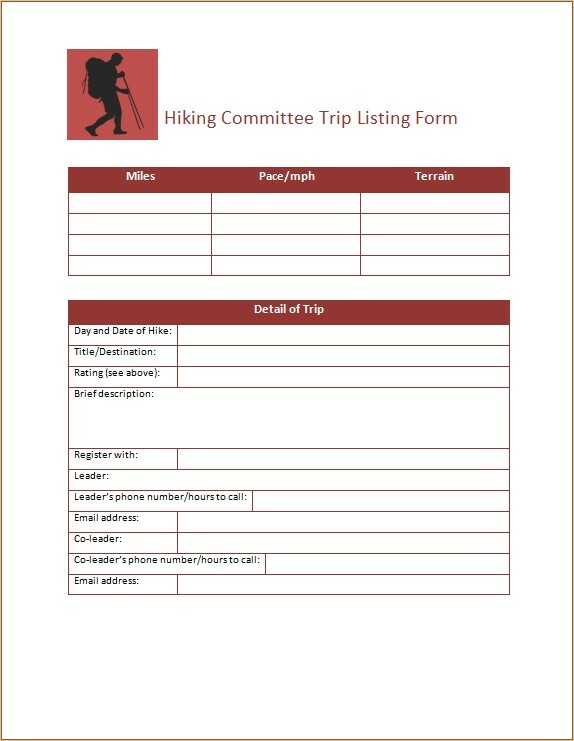 If you belong to such an organization or are an owner of such a hiking club you might require the hiking committee trip listing forms. These are forms made to convey the information clearly among the participants to avoid future conflicts and help in case of emergency on the trip. The company can put its policy right on the back of the form making things clear for everyone. The company logo is placed at the top to make it look like a property of an organization. Details about the trip are listed in the table given. This lets the participants know the exact distance they are going to hike and with what pace. To make the trip look more interesting a brief description with the name of the site is given. It is important to mention the date and time of departure and arrival. Name and contact number of the leader as well as the co-leader are provided on the form so that participants can contact them in case of emergency. Hence for your next trip, you don’t need to make a new form as you can download this form and use it for free.